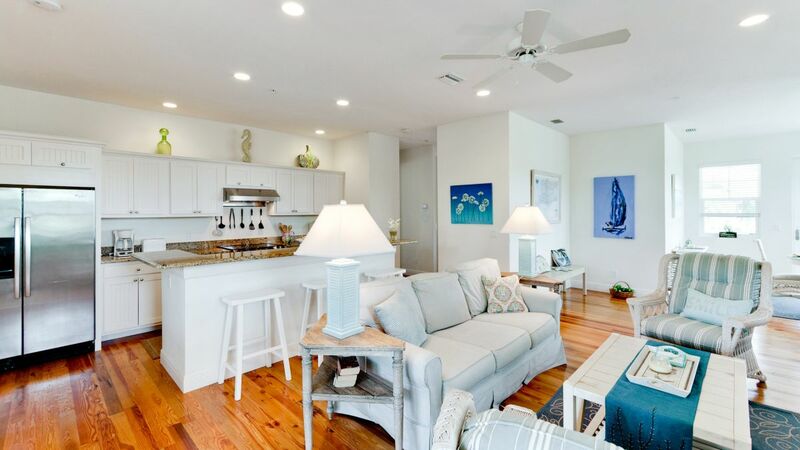 Seashell is 3 bedroom 2 bath condo that is set up like a single family home. 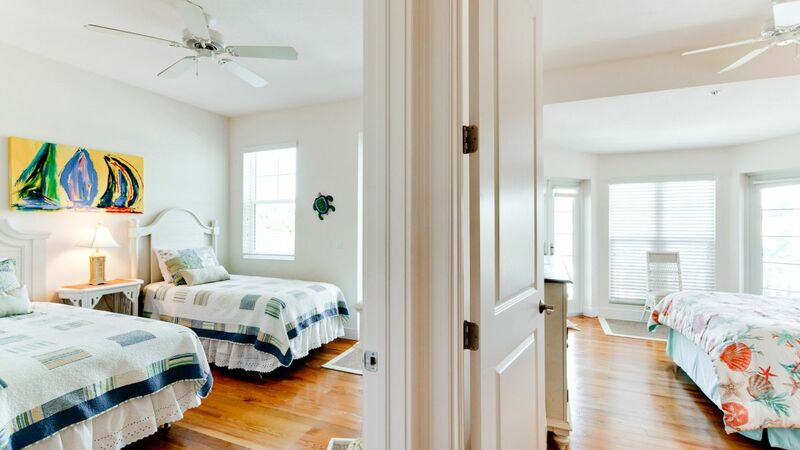 It features wood floors, a king size bed in the master bedroom, one queen bed in the second bedroom as well as two twin beds in the third bedroom. 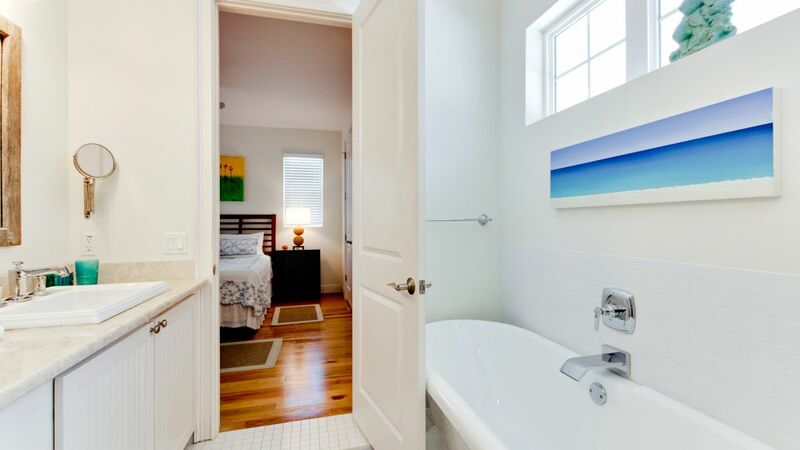 The master bedroom en suite has a shower, bath tub, granite vanity top with double sinks. 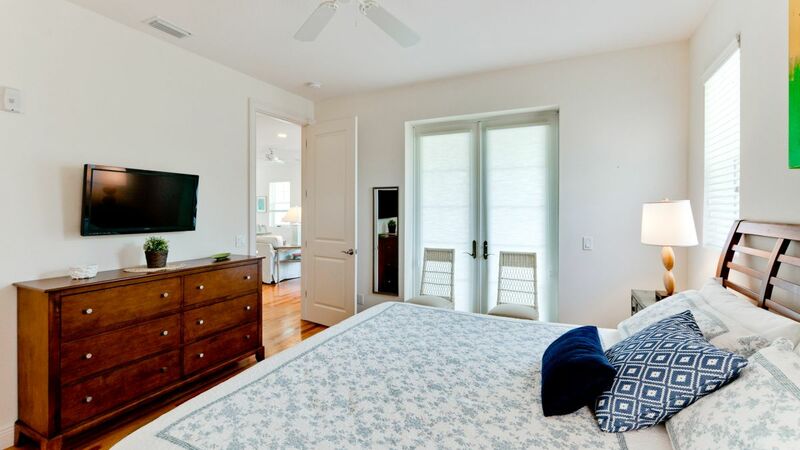 Each bedroom has its own flat screen television. The living area has a open floor concept with a breakfast bar. 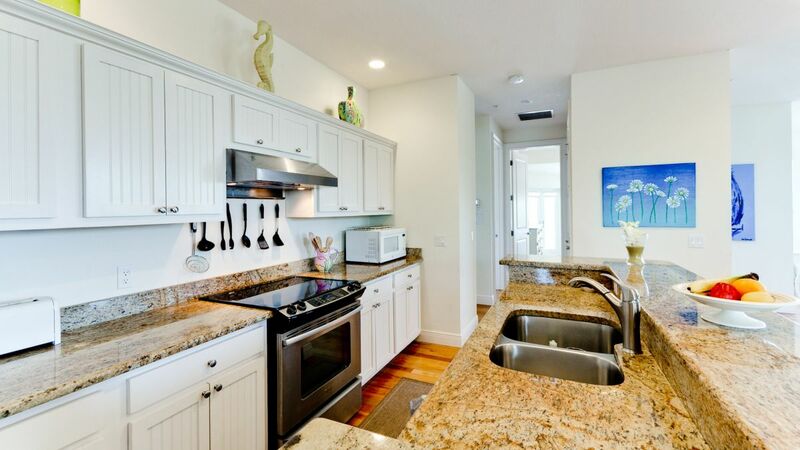 The kitchen entails granite counter tops which features a full range of stainless steel appliances. 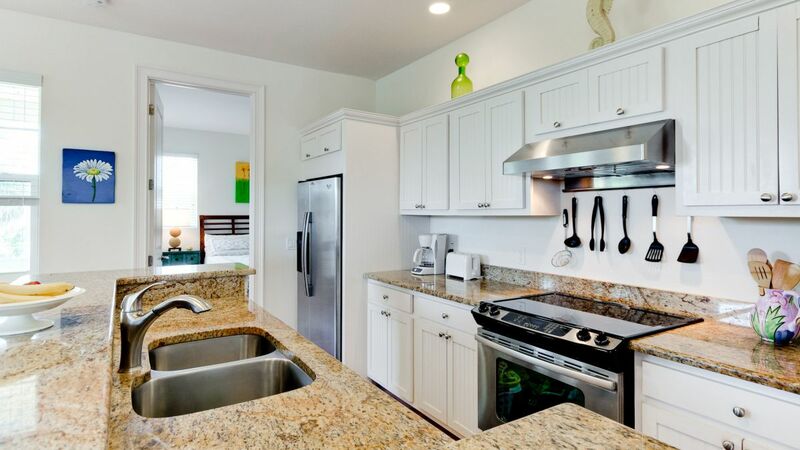 The fully stocked kitchen includes all your household items that make you feel like you are at home. From the living room area you have access to the front and back porch. 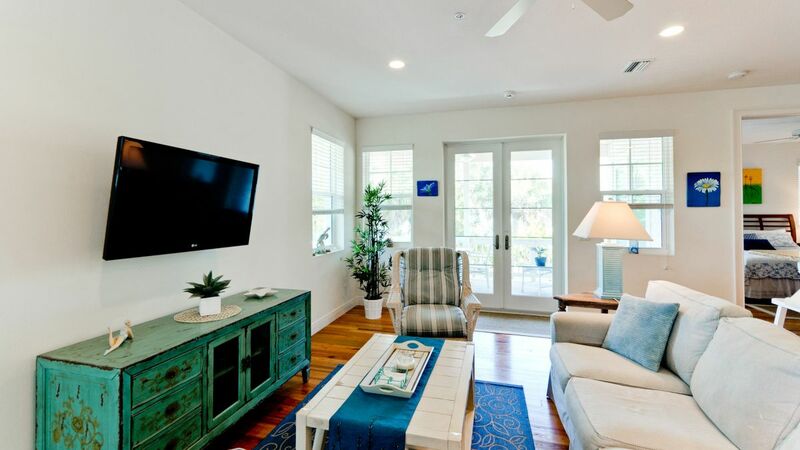 Indulge in the large flat screen TV in the living room that offers sports package and all local channels. Relax, as natural light will illuminate the whole living space. 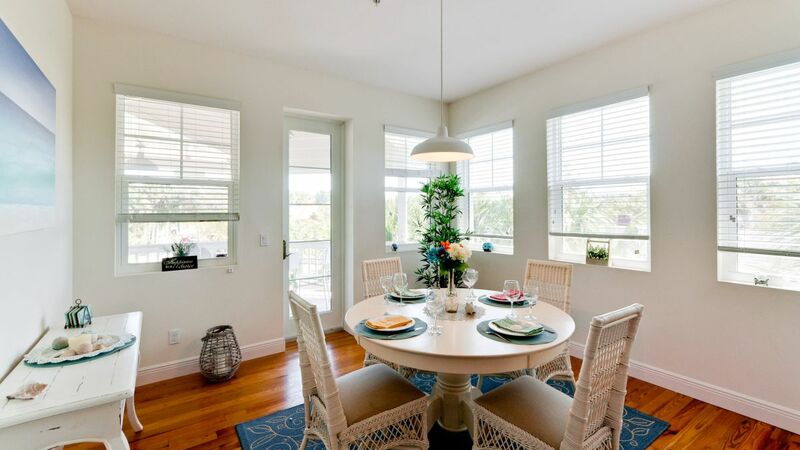 If you are hosting guests, the dining room table seat up to 8 people. The front porch faces south toward Pine Avenue. The back porch faces north overlooking the private fenced pool . Outdoor furniture and a charcoal grill complete the private pool oasis. Beach wagon and beach items are also available. One assigned parking. Bus stop of the free Island trolley is just in front of the house. At this location you could completely forget your car! Pets are welcome for an extra pet fee plus taxes. Please contact me with information regarding Seashell. We, family OG 6, spent one week at AMI. This was our first time in Florida so everything was new. This house/appartment was a great success. Our two kids loved the pool and the donut shop at the bottom floor. The accomendation was clean, a lot of space, well equiped kitchen and a lot of space. If you are looking for a 5* accomendation at AMI this is your choice! What a nice appartment and so close to the beach. The Donut experience just below, you are either happy to have a great donut or a freshly brewed coffee, either US or even European style. 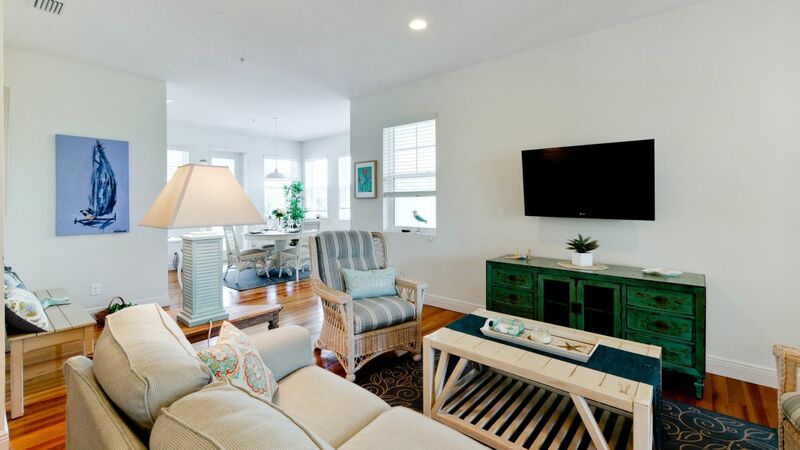 It is so close to the beach, 3 minutes to walk and you are in the sand. Had a great but too short trip to AMI and stayed at Seashell for the first time. Really enjoyed our time in this fantastically located home. Will absolutely stay in again! This rental was in the perfect location for convenience. 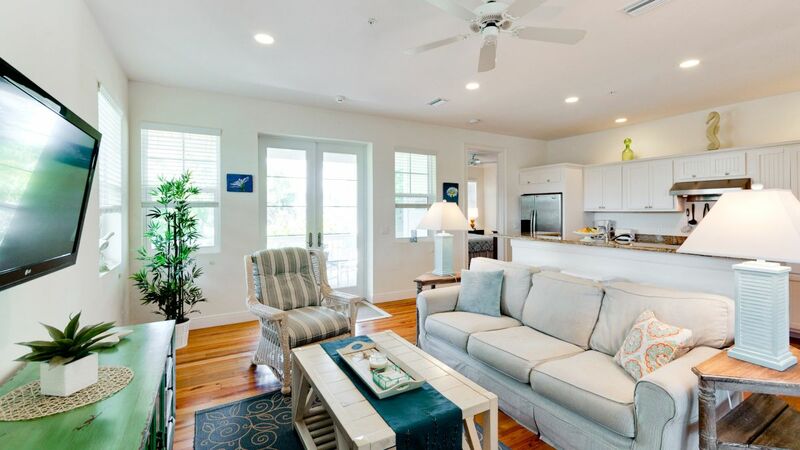 Allows you to experience all of what Anna Maria has to offer and a quick trolley ride to the faster paced Bradenton area beaches. The rental was beautiful and had plenty of indoor and outdoor space. This was our third time to the island and best rental yet! We were pleasantly surprised with a welcome bag when we arrived along with a coloring book and crayons for our 2 1/2 year old daughter - so sweet! We loved our stay at Seashell. We've been coming to AMI for years, but this was the first time we had stayed on the Northside of the island. It was wonderful being close to so many shops and the beach. We will definitely be back! One note: take your own t.p, paper towels, and dishwashing pods as there weren't enough provided for a 5 to 7 day stay. If you take it at the beginning, you wont have to worry about another trip to the store mid vacation! 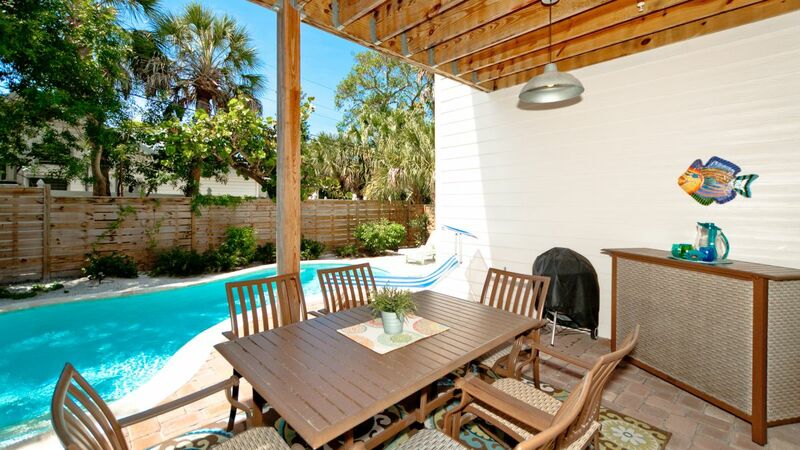 This townhouse is in the perfect location just a hop and a skip away from the beach. It sits above a donut shop and the most delicious Mexican grill where everything is made from scratch. The townhouse/ apartment itself was clean, quiet and comfortable for everyone. We had everything we needed, including all kitchen necessities for cooking in. The pool area was private and a perfect alternative to the beach. Thank you for a wonderful vacation! Beautiful beach, great place to stay in a perfect location on the island. We were very happy with our stay at Seashell. It was quiet, clean and comfortable with the pool as an added bonus. Only suggestion would be to provide a better quality of toiletries such as the soap and perhaps swap out the front patio set with something more cushioned and comfy. We had a great time overall. 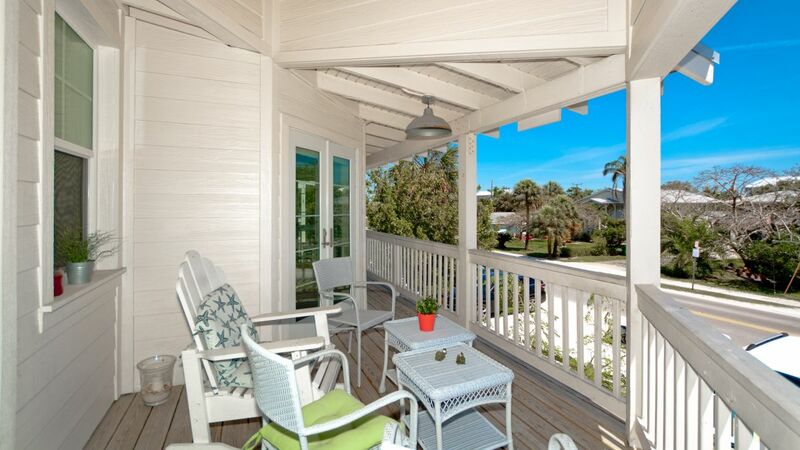 We loved our stay at Anna Maria Island. Perfect condo to stay in if there is 6 in your group. Very quick walk to the beach.The condo is decorated very pretty and very clean. It is located 20 minutes from Bradenton which is handy for putt-putting and restaurant chains. Our girls escape to Anna Maria Island was wonderful!! 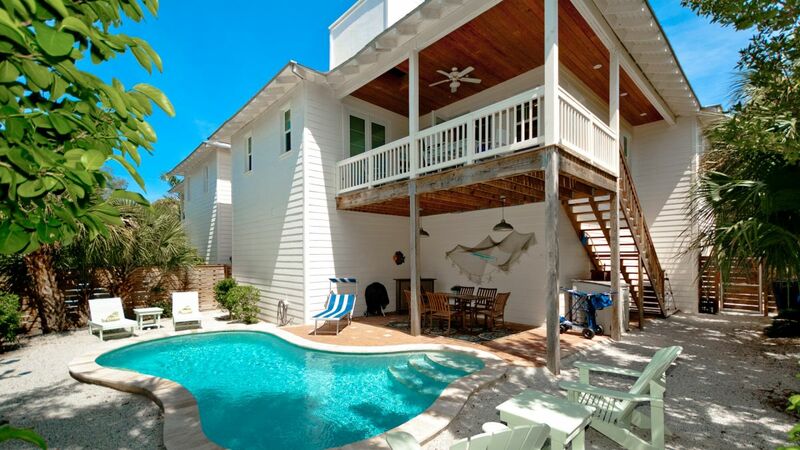 Seashell was the perfect property for the five of us to chill out for three days. It was cute, clean, and had everything we needed. There was plenty of room to all be together or to separate for quieter activities and time alone. It was close to the beach and restaurants so we didnâ€™t have to drive everywhere. We would definitely rent there again! The property was in a great location. Beach access was easy and Pine Avenue had plenty of restaraunts and shops within easy walking distance. It was also well taken care of and had updated furnishings and everything you could possibly need. The noise from the donut shop downstairs wasnâ€™t noticeable until it got busy later in the morning and then it was just in the back bedrooms. 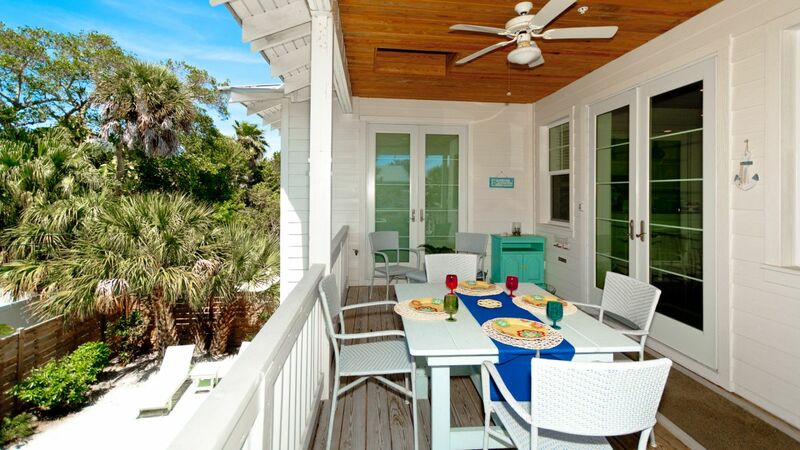 I've never rented on Anna Maria but live quite close by and it's my favorite beach in FL. I planned my annual girls trip here with my old college roommates (6 people total). We LOVED the rental (very clean and well decorated) and the location! Less than a block from the beach and the beach access has a popular local restaurant right there too. The rental itself is located on top of a coffee/doughnut shop (which is delicious) and next to a fresh Mexican style take out place (think along the lines of Chipotle), which was very convenient! Lots of little shops, cafes, and a spa within walking distance. I'm already planning another trip back with my family. Did I mention the pool? It was perfect! The property also has multiple porches to lounge on which was very nice on a rainy afternoon. My ONLY complaint is there is only ONE parking space for the rental. No street parking near by, no overnight parking in lot across the stree, multiple towing areas/ticketing. If the rental can accommodate 6 people there should be at LEAST 2 allotted parking spots. 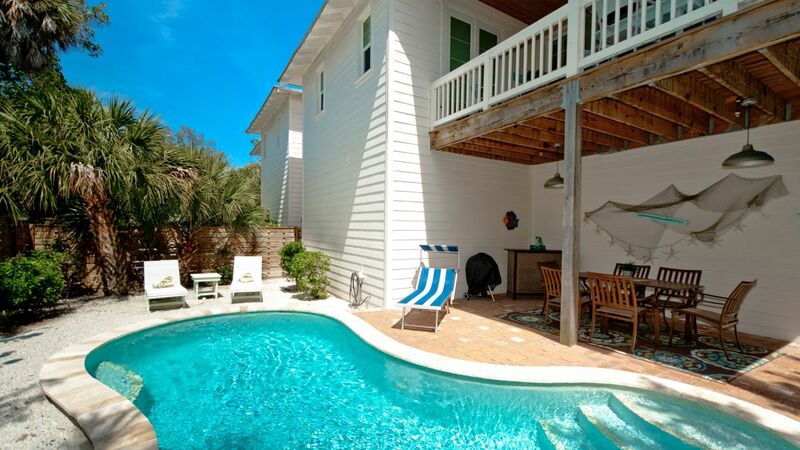 Other than parking being an issue, the rental and area is the perfect little beach get-away. We thouroughly enjoyed our week at Seashell. The apartment is very clean and bright. The location cannot be beat. The walk to the beach is 5 minutes and you are literally in the middle of cute shopping - and literally above the best food (donuts and mexican)! We were worried about noise from the donut shop, but it was minimal. We introduced ourselves to the donut shop manager and he was lovely and asked us to let him know if it was too noisy (which it wasnt). We loved our stay at Seashell. 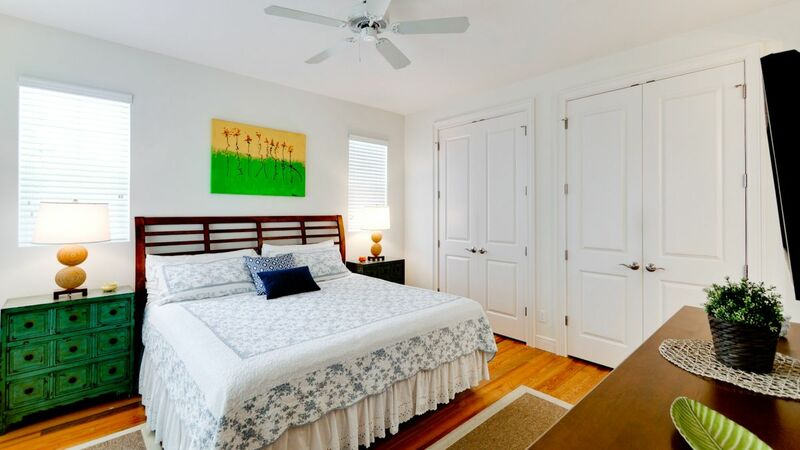 The rental unit is very complete, clean and comfortable inside and outside. Our grandchildren loved the pool. 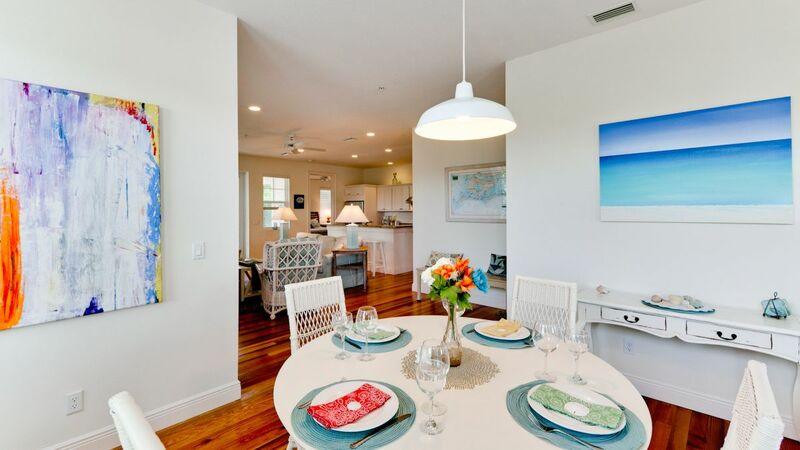 The location is ideal to the beach, shopping, restaurants and the trolley. Parking reserved for the renters is frequently a problem during peak hours @ the Donut Experiment patrons park bikes and scooters in the area regardless of the postings. The rental staff were very professional and responsive. We are looking forward to returning again next year. We had a fab stay at Seashell. The house is in great condition, nicely decorated and with all details in place. Great equipment in the kitchen, and lots of comfortable areas to hang out during the different times of the day. The porch on the second floor was our family favourite. Nice little pool and pool area. 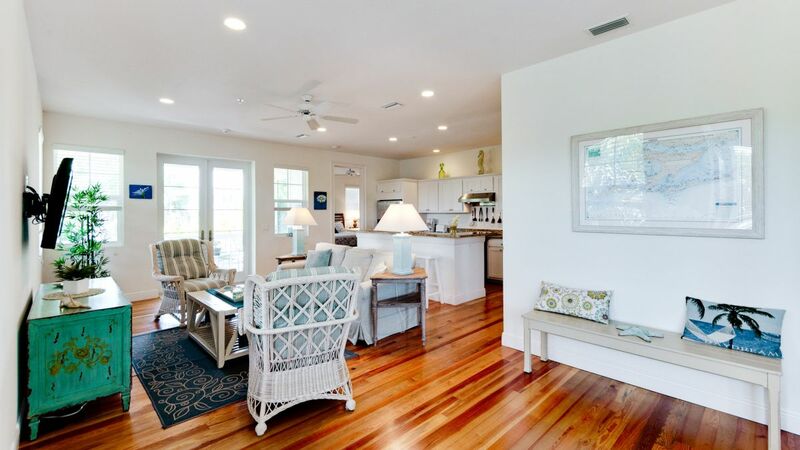 The location is great, only steps from the beach and in the nicest part of AMI. The donut shop downstairs is wonderful, delicious donuts and very friendly staff - the treated us to our first box when they heard we were the new neighbours! Hassle free checkin/checkout with key box, very convenient as we arrived fairly late in the evening. Seashell was very nice and updated. Due to it's location, it was very difficult to find with limited parking- only 1 (very tight) spot. Also, the living space is all upstairs. If you have any problems with stairs, wheelchairs, and/or children; this is not the rental for you. Besides that, Florida Dreams Realty of AMI was very friendly and helpful to fix any problem we had. It was a great location and the house was spacious for everyone. The negative would be that the pool was not heated, and I did not see this anywhere on the ad; so we didn't get to use it. I wouldn't have paid for a pool that I couldn't use. 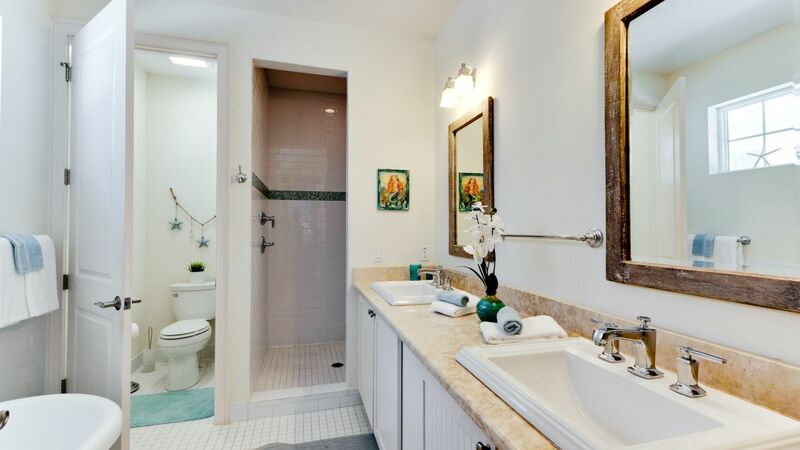 A gem of a place with well-designed spaces and nicely appointed kitchen and rooms. Despite a glitch with the door locking mechanism and the shower handle, all was very nice with this place and the rental agency responded quickly to both minor issues. This place was perfect for our family! 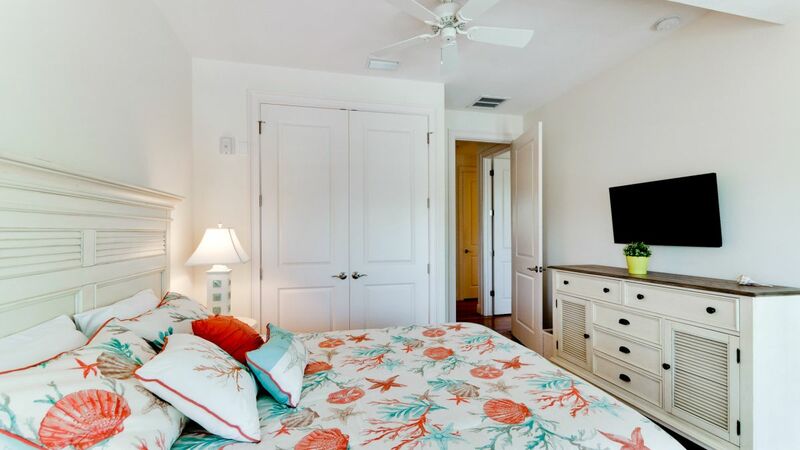 Close to the beach with everything you need to make it a great stay!! (Pool, beach chairs, a wagon, sand toys, washer/dryer). The place was immaculate. My 3 young boys thought the location above the donut shop could not be beat!! We spent 3 nights at Seashell and had a great experience. The condo was very clean and very beachy. It was a very short walk to the beach and the private pool was a nice feature. 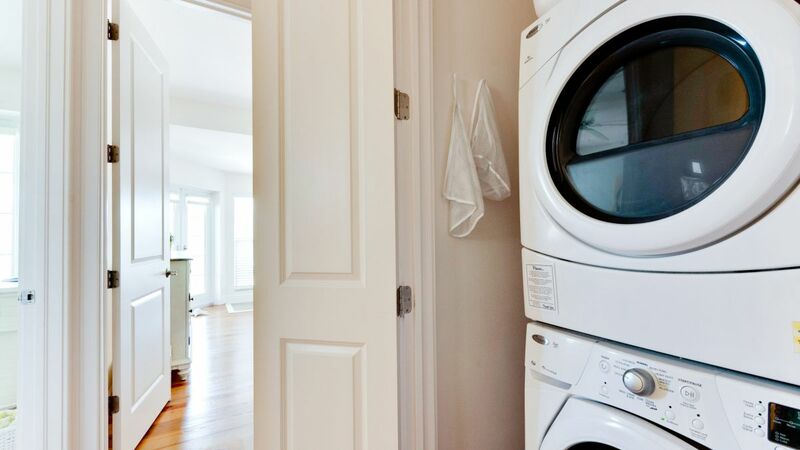 Our only suggestion would be to add a fan or noise machine to the two front bedrooms. If you are a light sleeper you can hear some noise from the doughnut shop below the condo. We loved both the doughnuts and the taco place nearby and would definitely stay here on a return trip to AMI. 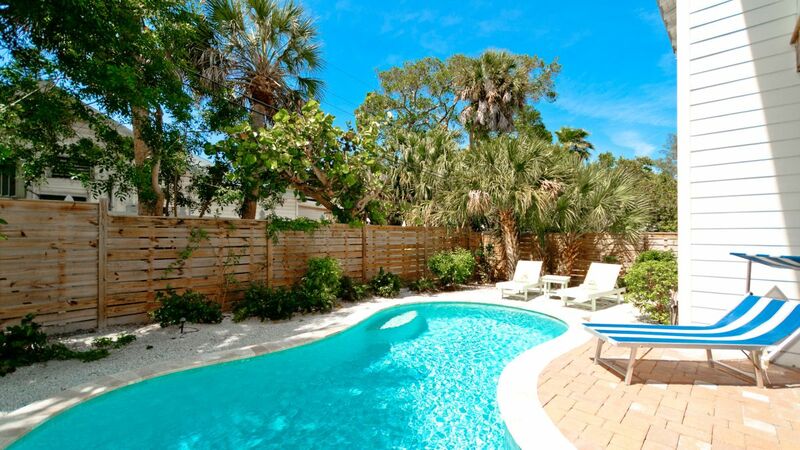 Have a small winter home in Sarasota, but my family and I love the Anna Maria area, so we decided to book at the sea shell for a three-night stay in August. Loved the unit, beautifully maintained. We loved the private pool and the location was absolutely perfect. A block-and-a-half to the beach to The Sandbar..we could walk up to the Waterfront Restaurant near the pier and all the shops along the way. Love being on top of the donut shop and Taco Shop would recommend to anyone. 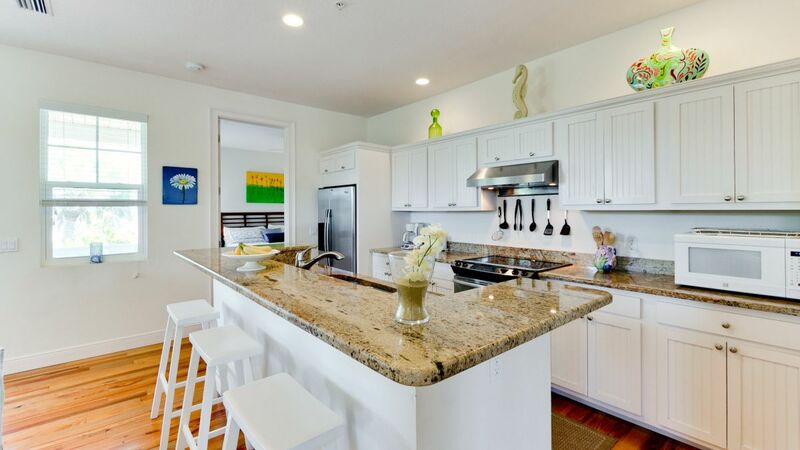 We had a wonderful and relaxing stay during our trip to Anna Maria Island. Seashell was an attractively decorated residence that offered plenty of space for us. 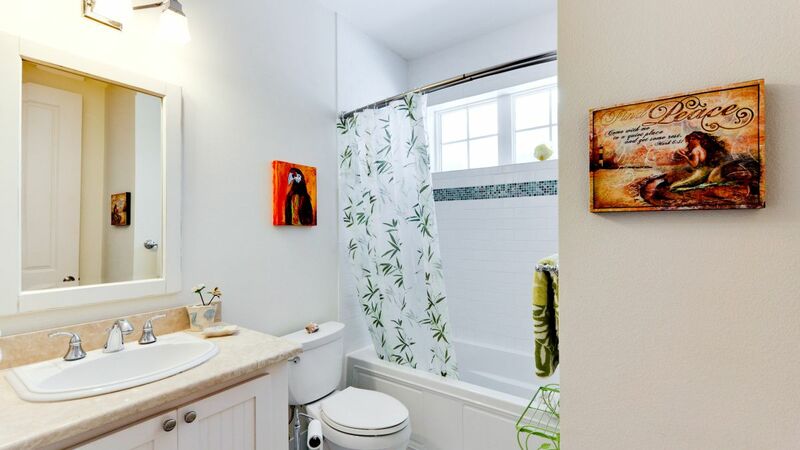 It is centrally located within walking distance of a variety of restaurants and shops. And the gulf waters are within a few minutes of walking. We thoroughly enjoyed our vacation to Anna Maria Island and look forward to returning to the area again. The home was well appointed with everything we needed for our stay. We were able to cook meals in and have everything we needed in the kitchen. The pool area was great and felt worlds away from what was going on out on the street. 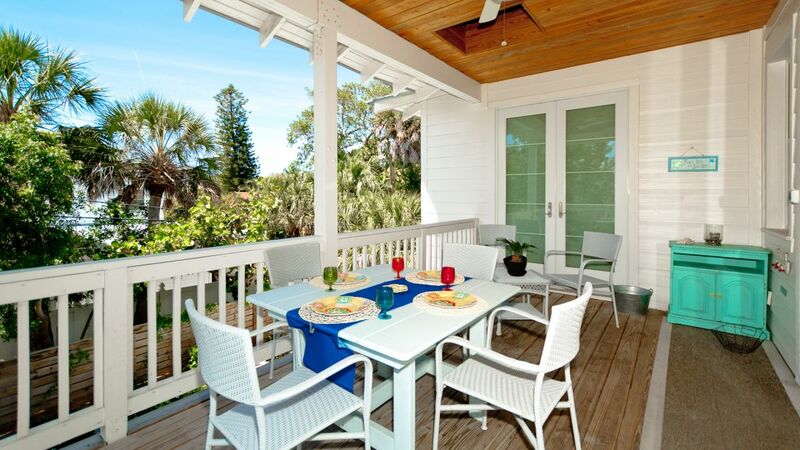 Two porches and the pool deck gave us lots of outdoor space to be outside yet not altogether. The short walk to the beach was just right. The trolley stop just out front was very convenient. We would definitely stay here again. What an incredible week! 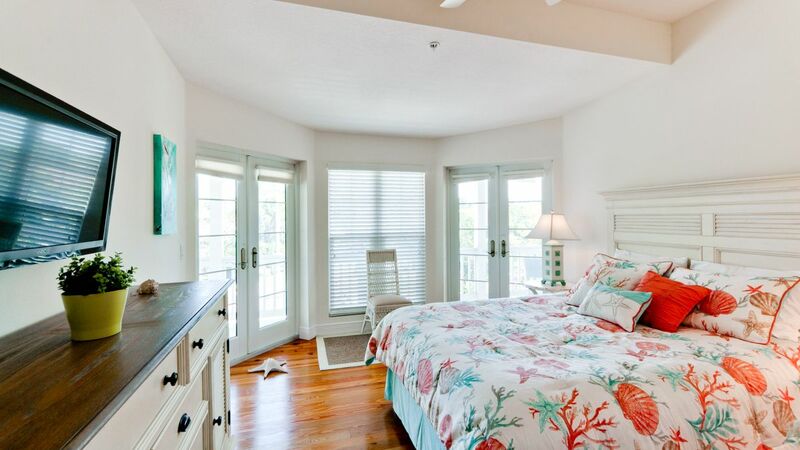 Our family of four stayed at the Seashell for the first week of April and could not have been more pleased. Not only was the property clean and spacious, the light that streamed into every room through the french doors and windows was fabulous. The pool was clean and warm and the cart and chairs provided for the short walk to the beach were appreciated. We were concerned about the noise level and business associated with being above the donut shop, and we worried for nothing! Not only was noise not an issue, one of our kids favorite memories was running down each morning to put in our custom order for warm donuts :) It was convenient to be just a minute from delicious restaurants like Poppo's Taqueria (Mexican) and Vinnie's (Italian) and at the same time have our own private pool and secluded backyard. We would not hesitate to recommend this property! We enjoyed a fabulous week on Anna Maria Island with our families and friends. 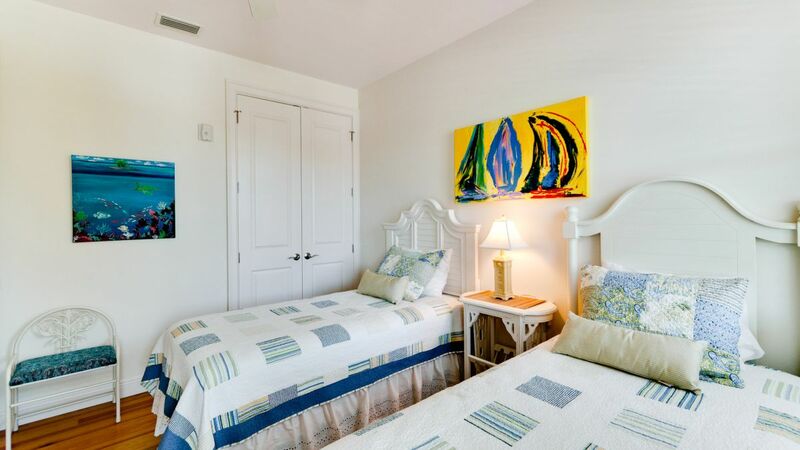 The Seashell was described very accurately - so bright and comfortable for our family of 6 - plenty of room for everyone. Being over the Donut Experiment was never an issue. Owners are very courteous. There is very little noise during their morning preparations which never woke us up. Can you smell the donuts? Only if sitting out of the front porch above the shop, which we found so enjoyable to watch the tourists starting their day with the most delicious donuts! 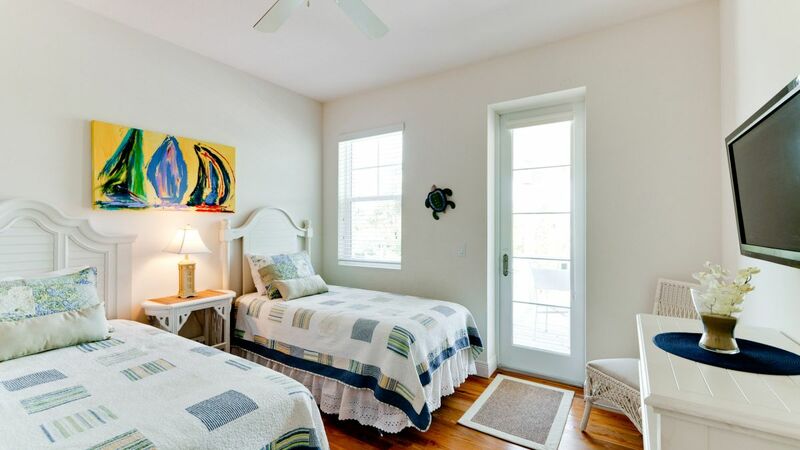 The location is perfect - very close to the beach, and walking distance to plenty of little shops and restaurants. We loved, Slim's, Harry's, The taco Shop and of course the donuts. We would certainly return and would recommend to friends! So happy with the rental for our vacation this year! 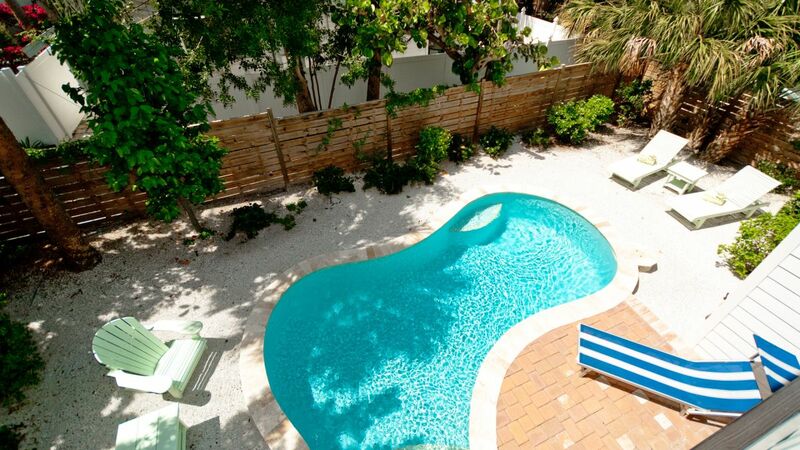 Great location, great space, great privacy while still being in the middle of all the AMI action. We will return! Loved the house! 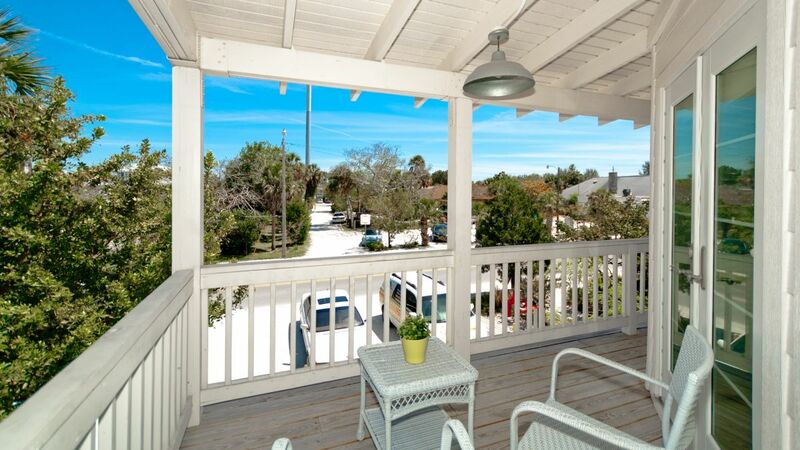 The location is perfect, as it's walking distance to the beach, restaurants, and shops. It's affordably priced, and updated and well maintained. I'd definitely recommend it! Clean, spacious, great layout, loved the location, plus comfortable beds & being above The Donut Experience rocked! We are so lucky to have found this place & it is our first choice from now on. We visit a few times every year. Great place, perfect location, no issue with business below, Marcus was great.